Scottish trout, cured using salt and demerara sugar then oak smoked giving it a mild, delicate flavour. 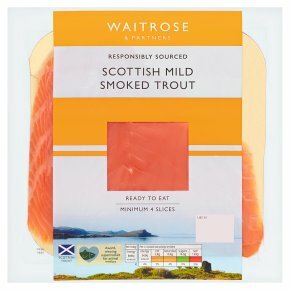 From Waitrose selected farms, where the trout are farmed to the highest welfare standards with care for the environment. INGREDIENTS: Rainbow trout (Oncorhynchus mykiss) (fish) (97%), salt, demerara sugar.